I got the best email the other day; Nikki of Perpetually Engaged spotted a birthday card I sent to Punctuation Mark's Elie and told me I simply had to start marketing my handwriting–I could practically hear a cadre of my elementary school teachers howling in their classrooms! The truth is that I love to practice loops and scrolls inspired by all the lovely invitations and envelopes I've admired. 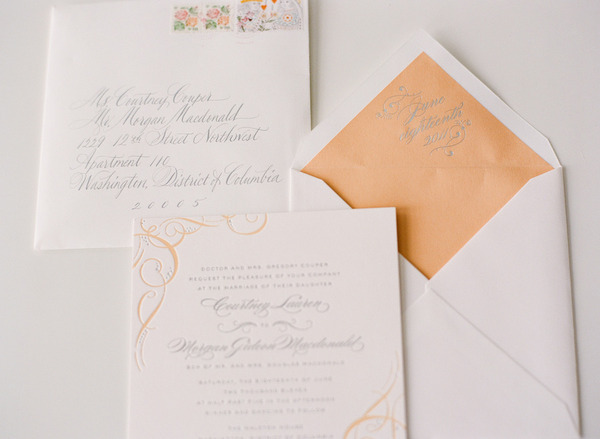 This peachy suite by Cheree Berry caught my attention right away–how can you resist the date calligraphed into the corner of the envelope liner, for heaven's sake? That's what I call attention to detail! Do you practice your handwriting, or is that a terribly embarrassing admission? Image by Abby Jiu Photography, Invitation by Cheree Berry Paper. how sweet! i dont practice my handwriting...but im tempted to practice my new signature ;) xoxo jillian:: enter to win a custom canvas print! Gorgeous!! Unfortunately I don't practice my handwriting, but I probably should... I think it might just be getting worse as the years go on! I'm dying here of so envious I am of your handwriting. I can't sign my own name properly and the same way twice. Bless your gift. And Nikki is right :). My handwriting is horrible! Horrible! But if I try it's pretty good- comes from all that Calligraphy we had to do in school. My teacher always complimented me on my 'o's and ever since them I like writing 'o's. Ugh, I have TERRIBLE handwriting. My parents are always surprised when I send something to them in the mail and it actually shows up because my handwriting is so bad. I saw your postcard on Punction Mark and totally agree - your handwriting is gorgeous! Make it work for you, girl! I love when people tell me I'm right...and I am! ;) Do it! Love that little message on the envelope flap. What a sweet surprise! love the detail on the envelope liner. Till this day, I'll practice my handwriting. I love writing in cursive. I used to have lovely handwriting. Maybe I should practice again. It always makes receiving a letter that much more fun when the writing is fancy. i would love to see "lena's handwriting - a stationery and calligraphy shop." you have unusually beautiful taste and i am sure your handwriting is outstanding. Cheree Berry's site is so adorable! Oh I definitely used to practice mine - and I agree, I think we need to see yours, maybe with a little online business? Delicious. I do practice my hand in calligraphy though I need lots of work! she's so right! your script is beautiful!! i definitely practice my handwriting, especially now that i'm hand-addressing the save the dates and invites! I don't practice, but I certainly should! i love these colors! my handwriting is awful. I always promise to improve it but it never happens. i wish i practiced. and love that you do. :) my brother is an amazing calligrapher (suddenly) which is hilarious because he was always notorious for having the most illegible handwriting of all time. I have the worst handwriting, and it has surely declined over the years. I can, however, analyze handwriting with a decent accuracy. Wow, just beautiful! What lovely handwriting you have. LOVE to write....always doodling....but would hire you in a sec for handwritten invites!! I have terrible hand writing and I think it changes constantly. But now I want to see yours. I always admire good penmanship. Such a soft, romantic invitation! Learn calligraphy has been on my to-do list since, well, it seems like forever. my handwriting is HORRIBLE!! so embarrassing, it's like a 5th graders!! Out of the corner of my eye I see a candle on fire...no jokes. But YES market your handwriting why not?!?! With this new-found knowledge, I'm only slightly miffed I haven't yet received a handwritten note in the mail, Lena darling. But actually, that might be bad, because then I'd have to write you back, which would mean revealing my own less than stellar script. When I take my time, it's not half bad...but 99% of the time, I rush and it's a sloppy, illegible mess. I need third grade again. I wish I practiced... Then perhaps I would be much better at it. Currently, my pen resides in the same category as 13 year old boys and doctors! Such a sweet email to get! i definitely like practicing my handwriting, it can make a letter so much more special. I always have practiced and I think I always will. It's fun to change with your mood! i have the handwriting of an adolescent boy. the more i practice, the sadder i become.